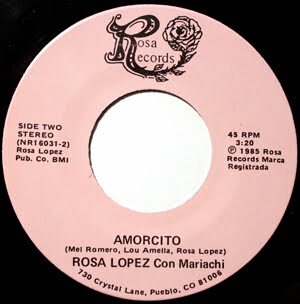 At only 4'11" Rosa Lopez could belt out a song, often overpowering the mariachi who played behind her. Born in Alamogordo, NM and raised in Roswell, she began performing at a very young age, touring throughout the southwest, Mexico and Hawaii, before settling down in Pueblo, with her husband Jesus, to raise their two children. In 1985 she released two singles on her own Rosa label. 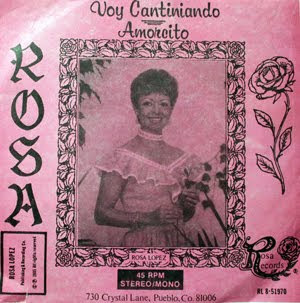 "Voy Cantinando" showcased her songwriting skills, while the b-side, "Amorcito" was credited to Lopez, Mel Romero and Lou Amella. The single was produced by Marcelino Noriega. The musicians on the record are not credited. 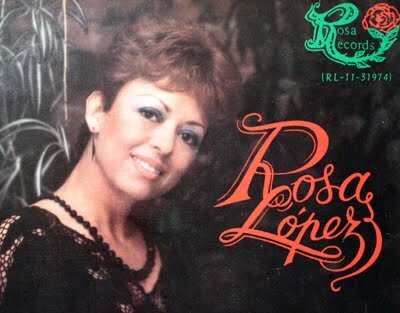 Her second record, "Chaparrito Consentido" and the b-side, "Toma Un Trago" (Rosa RL-11-31974) were performed with The Juniors Band, led by Juan Carlos Sanchez on keyboards, guitarist Tomas Jimenez, drummer Dario Rodriguez, and bassist Javier Fernandez. She again credits Lou Amella "for his constant support."